I’m sure most of you know that old Volkswagen Beetles would float, at least for an hour or so, but what about the discriminating buyer that wanted to spend a lot of time in the water? Did Volkswagen ever offer any solutions to those wet customers? I’m happy to say, yes, sort of, they did! Once, my friends, you could go to a Volkswagen dealer and order a real, working, VW-powered boat, called a Volksliner. This July 1960 Popular Science blurb here doesn’t make it exactly clear, but Volkswagen itself weren’t building this boat, even though there was an agreement to sell it at VW dealers. 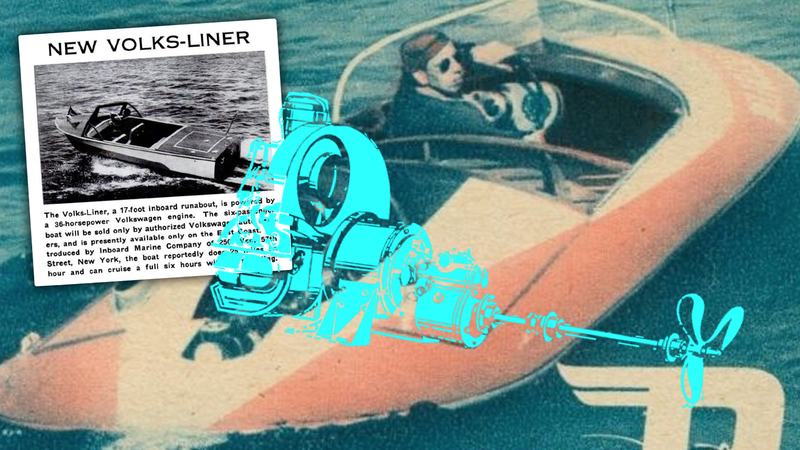 It appears that Inboard Marine was building the attractive fiberglass-and-wood boats and powering them with 36 horsepower Volkswagen industrial engines. VW sold their bread-and-butter flat-four as an industrial engine for decades, where it was often used to power pumps, ski lifts, and occasionally more fun things like Zambonis and Snow Cats. Look at the strange exhaust manifold setup; it looks sort of like the heat exchangers used on normal Beetles, but these appear to be cast aluminum and much larger, with the actual smaller exhaust manifold tubes inside. These seem to have been ducts to blow cooling air out of the boat, air that was taken in from ducts behind the boat’s rear seat. It’s not clear if the fan in its nicely nautical blue-painted fan shroud ducts into those as well? I’d think it would have to, with the cooling air sucked into the (screened over) fan assembly, then blown over the cylinders, then out into those aluminum pipes around the exhaust manifold. Also interesting is the 1.29:1 reduction gear transmission/V-drive there that eventually drives the propeller. It’s so compact compared to the usual transmission! 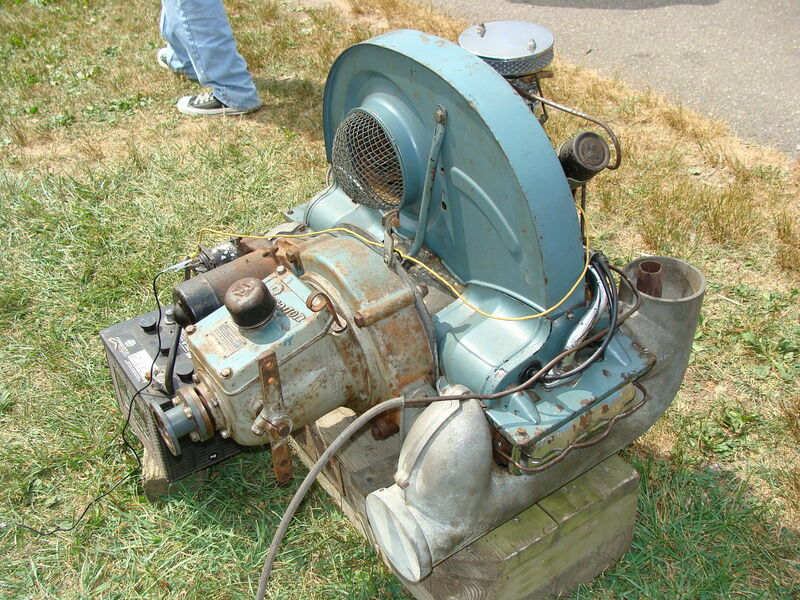 Other period pictures of the Volksliner show a strange, tiny, square air cleaner atop the carburetor. I’ve never seen anything quite like that, and have no idea why such an air cleaner would be good—perhaps it does something to help prevent water from getting in the carb? It doesn’t appear that many Volksliners were built or sold, and it seems that only East Coast VW dealers got them. The price for the Volksliner in 1960 was $2,495, which comes to about $21,000 in today’s dollars. That’s actually not bad for a powerboat! Similar boats of the era seem to have started around $3000, plus parts and serviceability for the VW engine were excellent. The Volksliner doesn’t appear to have been the only VW-powered boat option. This ad for the Delphin shows what looks like a much sleeker boat, if a good bit smaller, and seems to have more overt approval from VW, or, at least, the Delfosse company is less restrained about using VW’s actual logo. The Delfosse Delphin is interesting because it appears to be a product of Kurt Delfosse, who was a designer of small, light racing cars. The Delphin certainly seems to have a similar streamlined shape to the racecars. I didn’t realize how common these Volkswagen-powered boats were! I guess I just didn’t spend enough time at European waterfronts in the decades before my birth. That one’s on me.